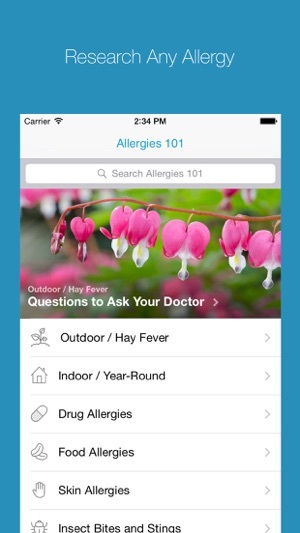 Based on the allergies you have, the free WebMD Allergy app for iPhone will help you prepare for each day with a personalized allergy and weather forecast along with doctor-approved tips that can be customized to your and your family’s specific allergies. 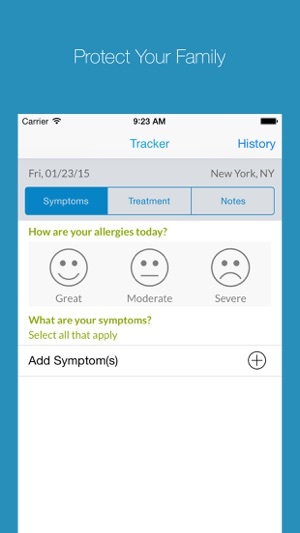 You can also track how you feel, RECORD symptoms and treatments, and add notes through an easy to use allergy tracker. Before your doctor appointments, generate reports to share with your doctor. 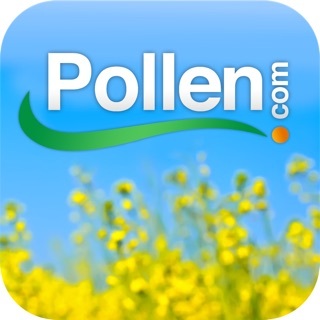 The WebMD Allergy app helps you to control your allergy symptoms by showing you the allergy levels in your area before you start your day. Whenever. Wherever. 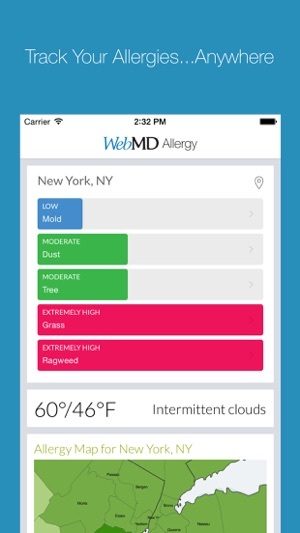 WebMD Allergy delivers up-to-date allergen levels based on your location. If you’re traveling, you can look up the allergy forecast for your destination and save locations that you frequently visit. Have kids with allergies? You can manage each family member’s allergies using individual profiles, too. 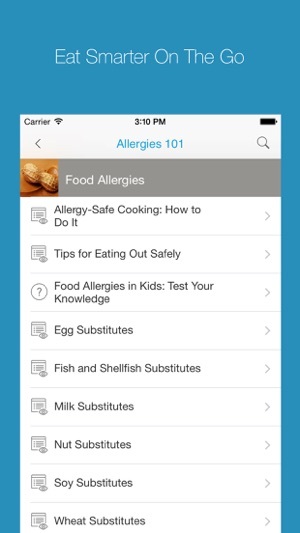 You can now get proactive with managing your entire family’s allergies from one place, anytime, anywhere! Browse through WebMD Allergy’s rich library of allergy articles, slideshows and videos in 7 categories: Outdoor, Indoor, Skin, Drug, Food, Insect Bites and Stings, and Latex. Or you can search to quickly find exactly what you’re looking for. Track how you feel, your RECORD symptoms and treatments, and add notes daily. Generate a report you can share with your doctor. - Help consumers take an active role in managing their health by providing objective healthcare information and lifestyle information. - Make it easier for physicians and healthcare professionals to access clinical reference sources, stay abreast of the latest clinical information, learn about new treatment options, earn continuing medical education credits and communicate with peers. - Enable employers and health plans to provide their employees and plan members with access to personalized health and benefit information and decision support technology that helps them make informed benefit, provider and treatment choices. The WebMD Health Network includes WebMD Health, Medscape, MedicineNet, emedicineHealth, RxList, theheart.org, drugs.com and Medscape Education. WebMD. Better Information. Better Health. WebMD does not provide medical advice, diagnosis or treatment. Always seek the advice of your physician or other qualified health provider with any questions you may have regarding a medical condition. Never disregard professional medical advice or delay in seeking it because of something you have read on the WebMD mobile application. I’d give this app a 5 star rating if it weren’t for the fact that the notifications have never worked. Not at any point in the years I’ve been using it and it’s been that way on multiple phones I’ve had so it’s not related to my device. I’ve asked support for help fixing it and have not been successful in getting an answer which isn’t helpful. 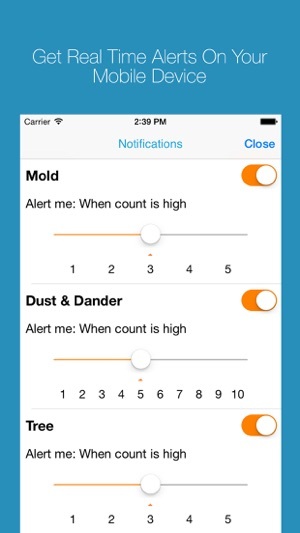 It’s great to be able to see the levels and allergens plus track all your symptoms and relief utilized. However if I knew via alerts a given allergen was high on a particular day, I’d change certain lifestyle factors to keep my symptoms as managed as possible. Initially I would go outside or do something that I’d never have done if I’d known certain things were high that day, so I assumed no notifications meant nothing elevated— and I was so wrong and it was months later I realized it just doesn’t work properly —so beware, and don’t expect to receive one if you have an allergen you try to avoid when elevated, because you’ll never be made aware by this app unfortunately. Minus that problem it’s otherwise a great app! Update changed to 5 stars. Don’t know what you did but I Turned on my iPad and the widget was set to my correct location. Thank you! I appreciate your prompt attention to my errant widget. Has a small but annoying problem. The widget insists on giving the information for New York, NY. I tap it and it does go to my correct location. I have gone thru the menu several times, turned off my vpn and rebooted but still the widget says New York NY is this just a default setting or is it a glitch or something unique to an iPad. Thank you for your assistance. I do like the program. As I said tapping the widget takes me straight to my location. The New York Ny widget is just annoying. 1) Add an opt-in feature to prompt me to add the day's tracker information. 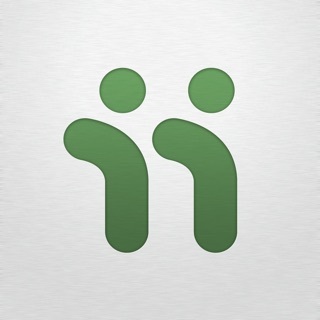 This would benefit WebMD as you'd get me on the app more frequently. Recommend making this possible from Apple Watch as well so I can do it while sitting in a meeting at work or at a traffic light. LOL. 2) Would love more than three options to describe how I feel each day - i suggest five. I forget the exact words used, but I wish I had the ability to be somewhere in between "okay" (medium) and "great"for example.